Kyla runs a mechanic shop with her brother Billy, one they inherited from their now retired parents. Billy is happy to let Kyla do the paperwork and work out in the shop as well as take over all operations when he needs to take a vacation. After he breaks his arm, though, all responsibilities fall to Kyla. She had other plans. She wanted to submit costumes for a contest that’s coming up in a few weeks. This is her dream, so she calls the only person she knows to help. Jericho Salomon hasn’t been in town for years, for good reason, but he can’t ignore his childhood best friend’s little sister. I loved absolutely everything about this book. Breakout Novels don’t just happen. Not every published novel out there is a breakout novel. Breakout novels are 10/5 stars. They are books you can’t put down. They are books you read entirely in one sitting. They are books you remember and enthusiastically tell everyone about. Every single one of Cathy Yardley’s books has been a breakout novel. The plot is excellent. The characters are larger-than-life, but also endearing and realistic. The stakes are real. I adored the relationship between Kyla and all her friends. I loved the fact that the previous books’ characters showed up in this book as well as all the other Fandom Hearts books. I got really mad at Billy for assuming that Kyla was better suited for the business paperwork than he was and for assuming her hopes and dreams weren’t as important because they were artistic based. 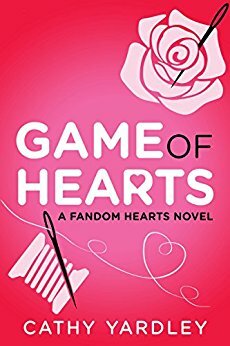 I can’t wait to get the next Fandom Hearts book to read! I received a free copy of this book. This is my honest opinion. This novel was published by RYW Publishing on January 30, 2018 and is available on Amazon here. Cathy Yardley has provided priceless and highly appreciated advice to many of the FVP Featured Authors over the past few years. Her writing craft is exemplary and her books are fabulously fun to read. Here’s a review of her latest release by Rachel Barnard, FVP Featured Author.